The Invacar pair have landed! – HubNut – celebrating the average! The Invacar pair have landed! I’m pleased to report that the Invacars are home! I scooped them up with a truck last week, as social media followers will already have seen, and they’re now adding some much needed glamour to my garden. Here’s the spares car, basking in the sun. There could well be some useful bits to be had from this one – the rear window for a start. Don’t fret though. What I don’t use will be sold on. Apparently, even the damaged body could be in demand from those who know how to repair glassfibre. TWC, the one I’ll be restoring, sits outside my office window. Perhaps this is why I took time out from my busy day job to give her a wash.
A half-clean Invacar. TWC gets a wash.
AC Model 70s had the blue impregnated in the glassfibre apparently, but TWC is an Invacar Model 70, built in Thundersley, Essex – spot the winged badge on the nose, whereas ACs had a roundel. As you can see, my pressure washer did a good job of removing the muck, but Invacars were painted, and some paint did come off as well. Mind you, I think that just highlights how poor the paint already was in places – it’s very bad on that front cover you can see, even before I started. With the muck blasted off, I even got some cutting polish out to reduce that big mark on the front wing. The result? That’s better! She’s almost presentable now. I’m thrilled with the makeover. The next day, I set about clearing the broken glass out of TWC, as at some point in the past 14 years, something unfortunate had happened to the rear window. Just as I’d finished doing that, the postman arrived with a special package. Yes, an FS880 key. I probably shouldn’t tell you this, but nearly all Invacars have the same ruddy key, which is also shared with machinery as diverse as dump trucks and cash machines on some buses apparently. 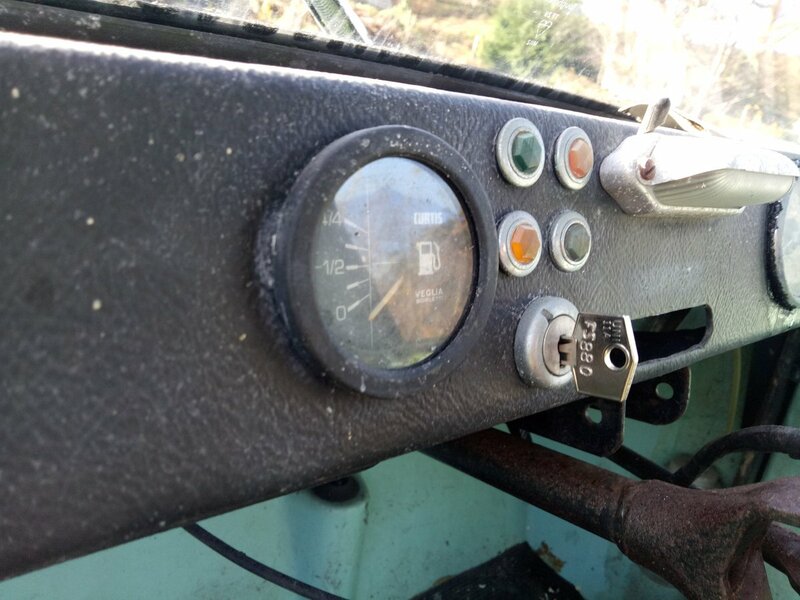 Quite how one particular key became so popular, I don’t know, but it fitted the ignition switch and works in both doors – albeit one of the locks has semi-seized and I can’t quite unlock it. I could unlock the rear engine cover though! What would I find beneath it? Well, there is an engine at least! I cleared out some of the dead plantlife and one or two cobwebs. I couldn’t turn the crankshaft pulley by hand, so I then whipped out both plugs and squirted in a bit of engine oil. With that done, I then applied a breaker bar gently to the fan, which then applied a turning force to the crank via those twin belts. That replicates the work of the Dynastart, which is housed within that fan. This acts as a starter motor and a generator in one. Clever, a like a lot of two-stroke microcars. I think it’s the first time I’d encountered such a device on a four-stroke engine. But, I can’t get the engine to complete a full turn. It’s likely that the engine has decoked itself, with large chunks of combustion material in the cylinder head now preventing the piston from achieving full travel. I’ve had this on the 2CV before, when I dragged its spare engine out of my aunt’s damp shed after a decade, and fitted it to the 2CV. That time, I laughed in the face of danger and just started the engine. It’s been fine ever since, but it could also have gone spectacularly wrong, damaging pistons, cylinder head and possibly even crankshaft. 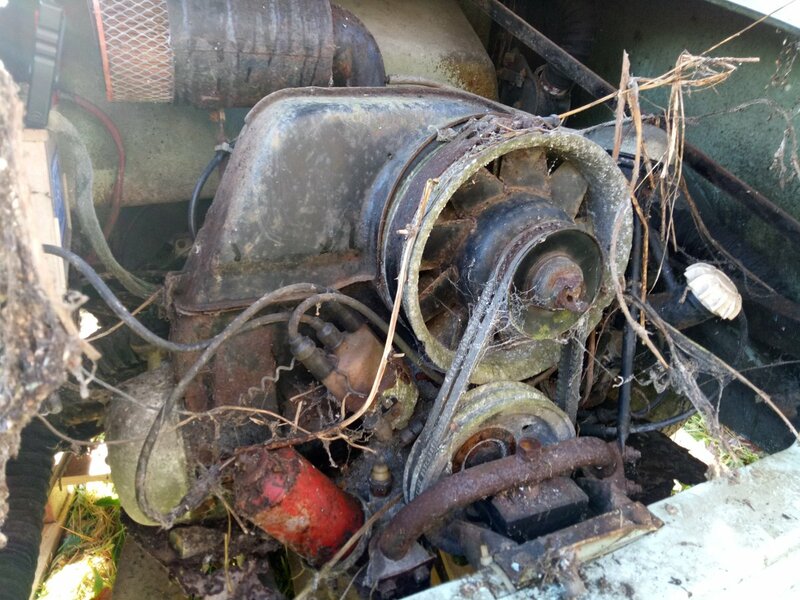 So, the sensible thing to do is get the engine out, where it’ll be a lot easier to remove the heads and clean things up. Probably no bad thing, as the electrics seem entirely dead, even when I connect up a jump pack, so it’s not like I was on the cusp of having it running anyway. The best I’d seen was a very mild flicker from the fuel gauge. As for how I got them home, all is revealed in the latest video. This is an unsual project and very interesting. Like many others im sure, I can remember these cars from my childhood. At the time, I didnt understand what they were. I just thought of them as noisy, ugly, small car and always sky blue.. Funny how they just seemed to dissappear? Anyway, I’m really looking forward to watching and reading how you get on with this. Looks like great fun to be had there 🙂 Good luck! Thanks. Should be fun! They were outlawed in 2003, which is why they suddenly vanished. Any chance the “spares” vehicle will start? I’ll certainly give it a go. Waiting with eagerness to see one of these run, even just to hear the little engine ticking over, what’s the plans when your have fully restored one ? I still think some sort of a fund raising trip in the car for a certain charity maybe ? Full restoration seems likely. I want to do enough to get it roadworthy, and not a lot more. There will certainly be some crazy trips. Cool, just don’t try jumping 6 double decker buses ….